Normally, I don’t post during the week. Today, however, is an exception. Why? It’s my blog’s 1-year birthday! Yay! And no birthday is complete without birthday cake. In this case, carrot cake. Carrot cake pudding to be exact. Yup, carrot cake without the flour, butter, and sugar. Sorry for the not-too appetizing picture by the way. Some things I’m still improving on. Rest assured though, it tastes amazing. It’s strange, because I wasn’t sure if this blog was going to even last a month. And here I am a year later. Here’s to another year! Boil carrots in a pot of water until tender, about 20 minutes. Drain and then place in a food processor and pulse a few times. Add in coconut oil, maple syrup, cinnamon, nutmeg, ginger, vanilla extract, baking soda and salt and blend until smooth. 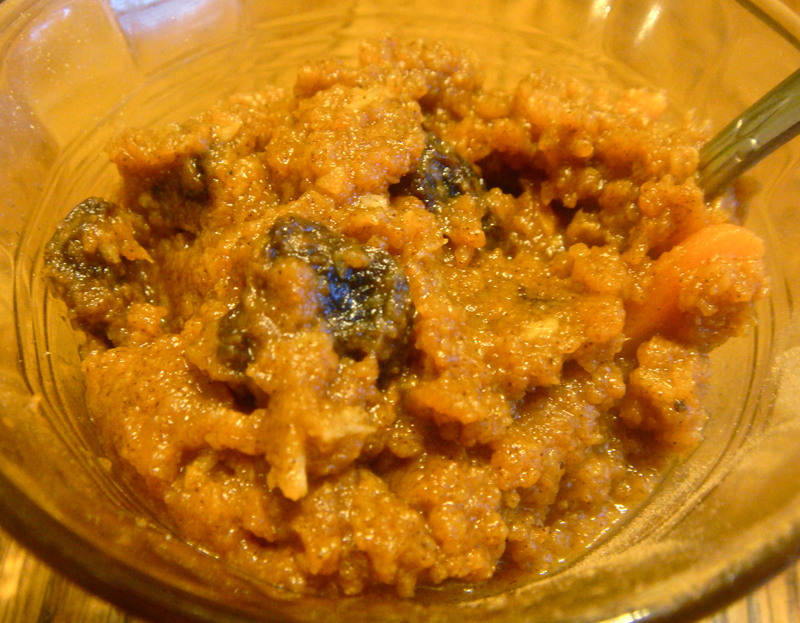 Mix in raisins and coconut and serve.